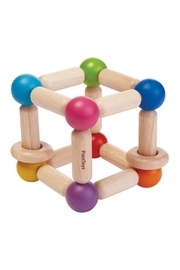 Wooden square clutching toy with 2 wooden rings that create a soft sound when rattled. This toy enhances fine motor skills while child grasps and rattles. Plan Toys are made of sustainable rubber wood and coated with nontoxic, vegetable-based dyes.